Esgee will present “Hybrid Fluid-Particle Plasma Modeling of a Radio-Frequency Gridded Ion” at the 15th Spacecraft Charging Technology Symposium 25-29 June, 2018 at the Integrated Research Center of Kobe University in Japan. We present a hybrid, fluid-particle plasma model that is used to investigate the plasma discharge and ion extraction behaviors of a radio-frequency gridded ion thruster (RIT). The hybrid approach combines a fluid formulation for plasma governing equations with a kinetic particle formulation for ion behaviors. 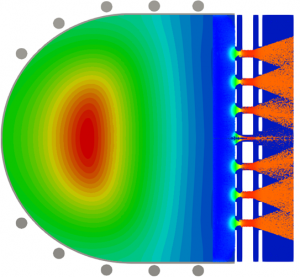 The self-consistent plasma model includes fully coupled electromagnetics and RF circuit models. Ion particles are dynamically generated from ionization rates in the discharge and tracked as they are extracted from the chamber by a series of electrostatically biased grids. 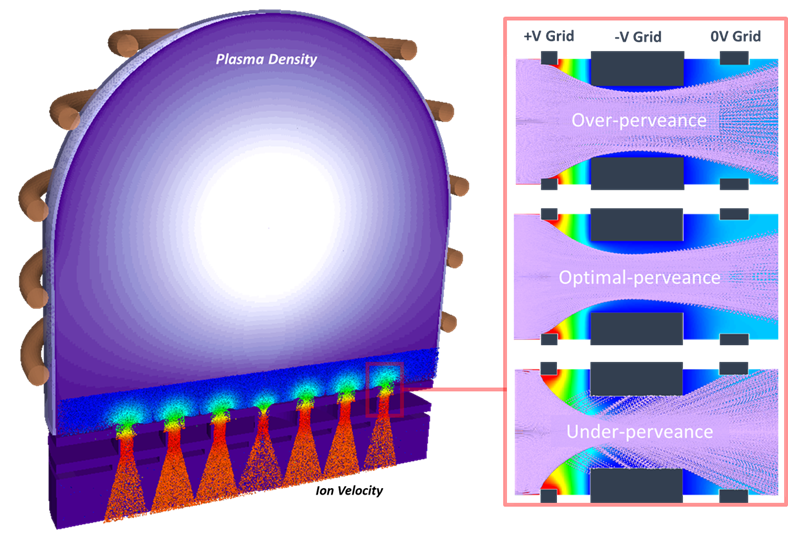 This hybrid approach offers an accurate representation of ion optics coupled with an efficient representation of bulk plasma discharge and chamber operating conditions within a single coupled simulation. Results are presented for an axisymmetric model of an RIT-3.5. Predicted ion density distributions and ion optics are compared to literature with reasonable agreement. Performance sensitivity to grid potentials are studied to demonstrate model application to thruster performance optimization. The OverViz Simulation Suite, with coupled non-equilibrium plasma and kinetic particle modules, is used to perform the simulations.